Google Analytics has become one of the most valuable website tools available to webmasters and digital marketers of late and we've become reliant on it to not only monitor site performance and marketing spend but also as a basis for businesses decision making. Over the past few years, Google has continued to improve its analytics platform in order to help us understand online user behaviour and get the most out of the traffic we attract each day. 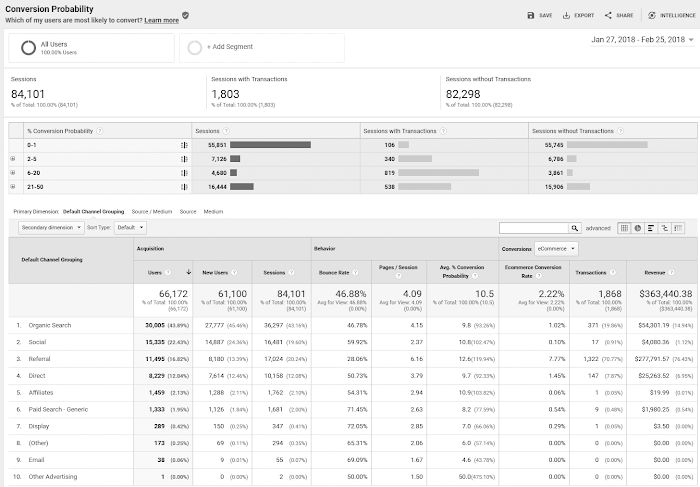 The latest addition to Google Analytics is their Conversion Probability report which will be eligible customers both free and paid (on the Google Analytics 360 platform). What is a Conversion probability Report? The new conversion probability report allows you to understand the likelihood of when a user is most likely to convert. The conversion probability calculation is based on a machine learning model that learns from users who have made transactions in the past and then applies these multiple signals to all users visiting your site. You can then use this metric to segment and create audience lists and reach out to them using AdWords and DoubleClick or provide personalized experience via Google Optimize. Which will, in turn, help you drive higher conversion rates at a lower CPA. Using the same data modelling techniques that determine Smart Lists and Smart Goals, Analytics calculates the % Conversion Probability dimension and the Average Conversion Probability metric to determine a user’s likelihood to convert during the next 30 days. Transactions for each user are evaluated, and the resulting probability of conversion is expressed as an average score of 1-100 for all users during the date range, with 1 being the least probable and 100 being the most probable. A value of 0 indicates that conversion probability is not calculated for the selected time range. % Conversion Probability is calculated for individual users. The % Conversion Probability dimension, with ranges as dimension values, is available in the Conversion Probability report, and in Analytics segments, remarketing audiences, and custom reports. The Avg. Conversion Probability metric is available in custom reports. A minimum of 1000 e-commerce transactions per month in the reporting view. (You must have implemented Ecommerce Tracking). Once you reach the initial threshold of 1000 e-commerce transactions, Analytics then needs 30 days of data to model. If the number of transactions in the reporting view falls below 1000 per month, then Analytics uses the last good model to generate data for the report. So how can you put this newly found conversion probability data to good use? How your users who demonstrate a strong likelihood to convert compare with your overall user base. Do they represent a small fraction of your users, or do your advertising and site combine to engage a large percentage of your users? Which channels, keywords, and campaigns deliver highly engaged users. What percentage of your users are less likely to convert? Are the keywords and campaigns that draw users who are unlikely to convert differently from the ones that draw more valuable users? If they are, does it make sense to devote less budget to them? Which conversion paths do the lower-scoring users follow? Are there opportunities along those paths to deliver more effective marketing? Users who are on the threshold of converting are more easily convinced to complete those conversions. For example, users who have studied product details or added items to their carts have given strong signals that they’re already taking ownership of those products. A persuasive follow-up from you via a well-crafted remarketing campaign can provide that last nudge they need to complete the process. Creating remarketing audiences based on your users who are more likely to convert and publishing those audiences to your various marketing platforms like AdWords and DoubleClick Bid Manager lets you re-engage them everywhere you have an online presence. You can also publish these audiences to Google Optimize so that you can understand exactly which refinements to your site content deliver the highest likelihood of conversion. Select Audience > Behavior > Conversion Probability. Conversion Probability data is delayed by 24 hours: this report depends on the complete processing of the daily-aggregate tables. Note: If a reporting view does not meet the prerequisites for data, then the report is not visible in Analytics. Also, Conversion Probability is currently based only on transaction data so for those using goals for lead generation, this report won't be applicable to you, for now. While this iteration of the report may be limited in its reach and functionality I definitely feel it is only the beginning and this sort of data modelling will evolve over time to become one of the most important reports in analytics. Having access more data and new ways to interpret that data can be what sets you apart from your competitors when it comes to executing new campaigns or updates to your website.